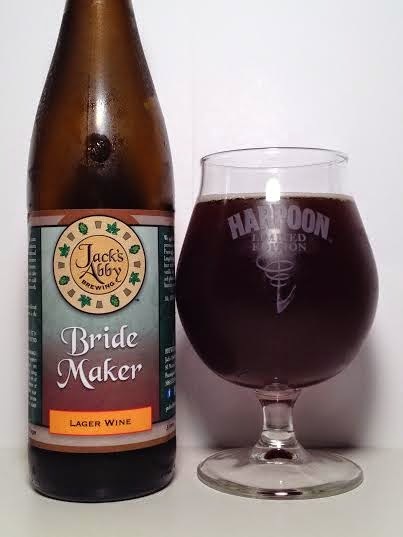 "While Bride Maker is the same style of beer as Baby Maker, the recipe was reworked. The main difference is the use of Special B malt to give it more color and body as well as notes of caramel, toffee and dark fruits. We feel that Bride Maker is a sweeter, more well rounded take on the style." Oh, the anticipation is killing me! The pour is considerably darker than last year's offering. It's a dark, rusty mahogany/burgundy reminiscent of English Barleywines. No head at all. The aroma is quite the malt bomb with big dark fruits like raisins. As it warms up, I find hidden deep in back are some toffee and caramel. This must be said: This was barrel-aged? I pick up virtually no bourbon at all. It's almost the ghost of bourbon past. Any booziness that existed in last year's batch is a distant memory. Holy crap is this smooth! Rich caramel greets you on the way in followed by tons of malt. There's a lot of fruitcake taste to this, almost as if I'm drinking a world-class doppelbock. A lot of raisin and even plum notes too. At the same time, the bourbon (thank God it showed up on the taste) ties everything together in a nice melting pot of flavor. Just spectacular! As I said, no booziness anywhere. Good luck trying to find even a trace of that 13.00% because I think I killed my whole bottle in less than 30 minutes. This is supposed to be a sipper, but it's so delicious and smooth that I just can't help myself. It doesn't have a lot of carbonation and it feels thick and syrupy, but not cloying. Comparing Bride Maker to last year's Baby Maker is tough. Both experiences yield different results. This year's offering isn't as prominent with the bourbon taste, but isn't as boozy either. The fact is that Bride Maker is a world class beer. It's a perfect combination of a doppelbock with dark fruits, malt, and fruitcake while at the same time sticking to the toffee and caramel sweetness that made me fall in love with last year's batch. Barrel-aging this year's recipe resulted in a smooth ride with no alcohol presence. While I do wish there was more bourbon on the aroma and taste, I won't let that hold me back from calling this near-prefect beer in all aspects.